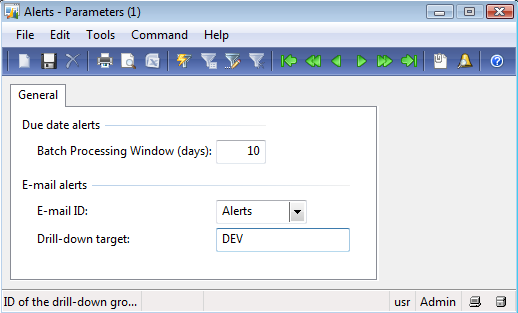 In this example you are creating alert rule on a field what if I want to create alert rule on the click of a button. & Sales invoices are settled. someone wants to get reminder for journal for its posting. system should keep reminding the user unless he has posted the JV. 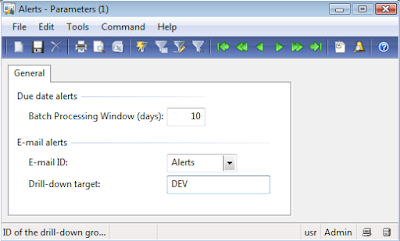 - I created the Alert Rule in batch job history table and I gave start in it. The pop up appears, and the email also comes but the email which is coming is nothing but the alert message. But it is not showing my email template message. it is always showing the standard message "The batch job CheckTest completed successfully". where checkTest is the name/description of the batch job. What I understand you are asking for is an email notification when a batch job completes, but the job executed fails. The only way I could figure out how to do this was to create a table that would store the error log (use ReqLog table as example). I added another boolean field to indicate that the log field was not empty on record insert. Then I set alert to email when the Boolean field was true. 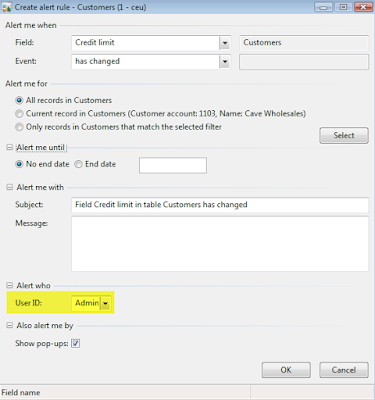 Additionally, Is there any way to put 'Modified By' user or 'Last Action Taken By' user or something relevant. Thanks in advance for prompt response. Easily! 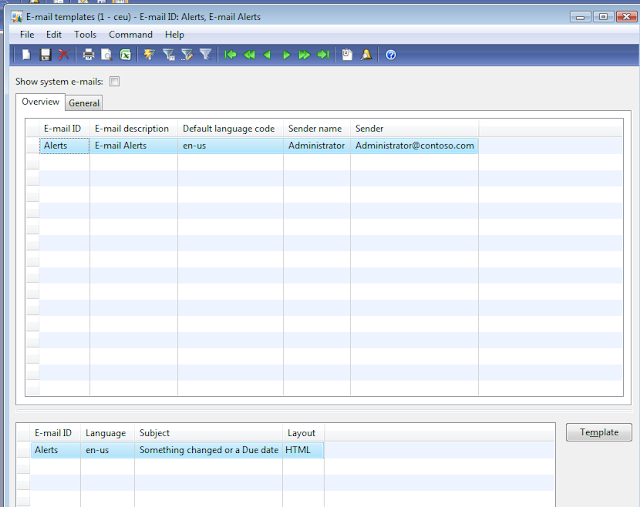 Just modify `\Classes\EventActionEmail\createEmailParameterMap` and add additional parameters you want displayed, then modify your template to include the %parameter% so it is displayed. where can I find %parameter% defined to use in the HTML template? "%parameter%" is just any placeholder you want. It could be "%MyName%". You need to define it in `\Classes\EventActionEmail\createEmailParameterMap` where the lines say parameterMap.insert('MyName', 'Saan Jones');. 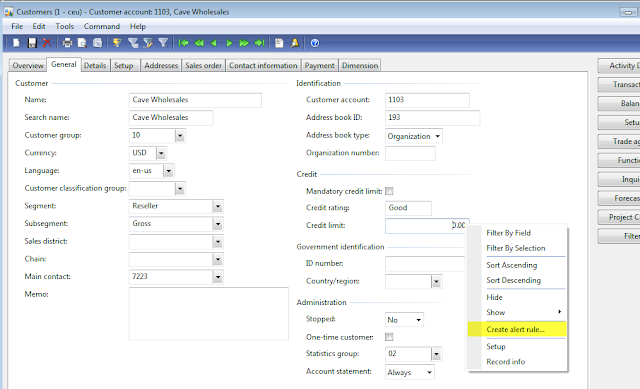 This is where you can expose additional variables of your choosing. Thanks Alex. The link below in your message comes with the message "Sorry, the page you were looking for in this blog does not exist." Any help. I am trying for a shipment status event. It picks the shipment number but I am interested in pulling the purchase order number and the line description on the email template. How is it possible?Do I need to define this in the createEmailParameterMap ?Any help would be helpful. 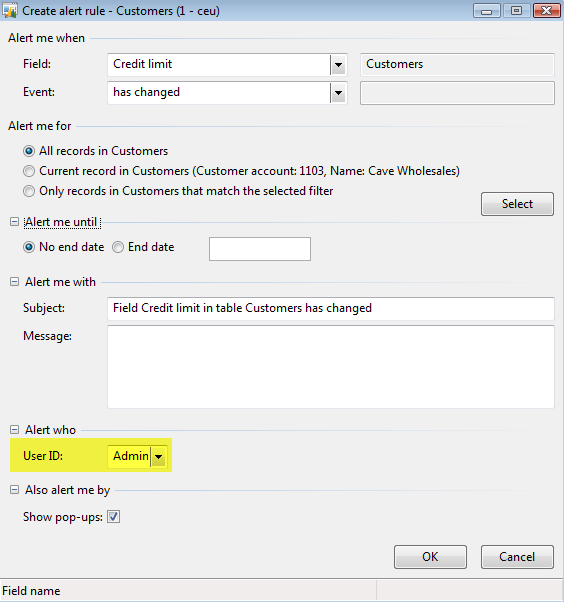 How do I get an alert if a customer has been set up with an empty field, ie, I want to know that the Site has been left blank. I tried to set the event on the field to 'is set to' and then left the fileld blank. I've also tried "", and ' '. If you need drivers you can download here.